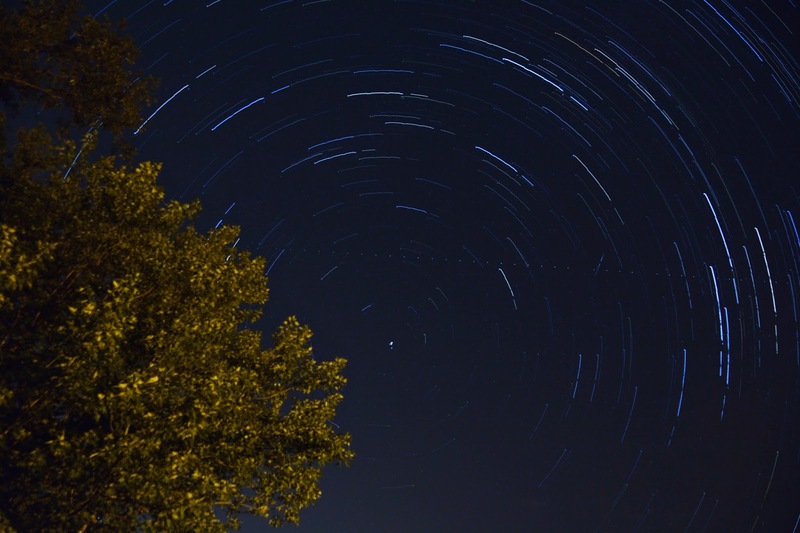 Playing with the camera to get star trails. Notice the airplane as it flickered across the sky. The inaugural first dinner in the new pit. Pearl Harbor but can't find anything. had to check out the American Pickers store in Leclaire, Iowa. We didn't see Mike, Frank or Danielle. Lacey could be with us since her mom couldn't. Bubba's shirt since the day they were born. Elsie was not feeling too well today. Took the girls downtown today to play at the pedestrian mall. public pianos and of course a great ice cream shop. that walked throughthe back yard yesterday. last year on this date. Another one with funny faces. This is the funny family photo, of course we had to take that kind too. First time in five years we are all in one place, with the two newest additions. blueberries from Bear Hill Farm. produce organic vegetables at Mountain Cloud Farm. Had a wonderful day on the water swimming and boating. Zola did a great job driving the boat. I love to get lightning shots. This is far in the distance behind a mountain. Coming home from the lake Darren spotted this on the top of the hill. I took the first photo from the car then zoomed it in for the second one. even while dressed up in pink. She and Sea-Bas are new friends. Two very tired kids after a great time at the beach. Another day of driving then home. Go fly a kite Elsie. and I can't get this song out of my head. Capitola for his first family reunion extravganza. Huntley is the sweetest baby and a wonderful addition to the clan. boys can hardly wait till they can go too. unfortunately had to say an early goood-bye for work and school. I know was hard to leave but sometimes real life wins. Cousins that love each other. Mary Danielle decided they would try dancing for donations. Brea and Warren are relegated to the floor. outside our condo. It was plenty for this tired Tutu. clutter will be gone. Photo credit goes to Elsie. Had a fun spinner dolphin show this morning. The girls discovered this today. A few hours ago there were just three eggs.